Superconductivity is a fascinating state of matter in which electric current flows without dissipation of energy. 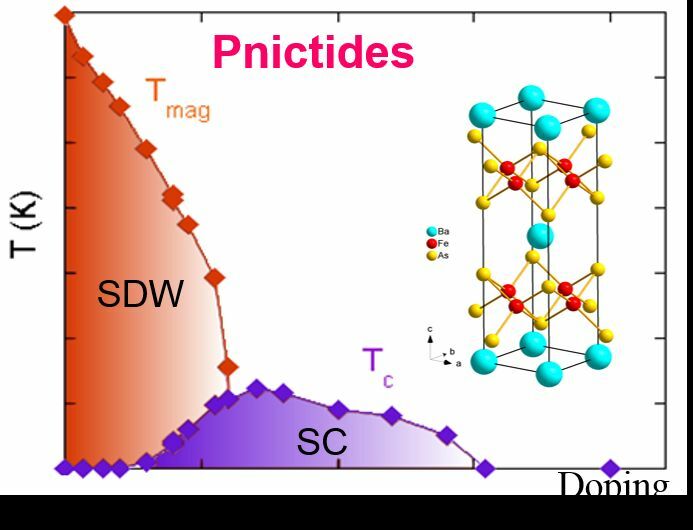 For thirty years, the search for high-temperature superconductors focused on cuprates, however, the origin of the pairing mechanism is not yet clear because of the high structural and electronic complexity of these materials. To study the properties of high Tc superconductors, the sample quality is a crucial element. One of the strengths of the group is to be able to implement various advanced techniques to synthesize ceramics or single crystals cuprates, including mercury cuprates of the highest Tc of (135K, or -138 ° C) at ambient pressure but also new iron pnictides. These pure or substituted compounds, including cuprates are actively elaborated and studied to capture the main features of the electron pairing mechanism. Optical observation of spin-density-wave fluctuations in Ba122 iron-based superconductors, B. Xu, Y. M. Dai, H. Xiao, B. Shen, Z. R. Ye, A. Fo,get, D. Colson, D. L. Feng, H. H. Wen, X. G. Qiu, R. P. S. M. Lobo, Phys. Rev. B 94 085147 (2016). Unconventional High-Energy-State Contribution to the Cooper Pairing in the Underdoped Copper-Oxide Superconductor HgBa2Ca2Cu3O8+d, B. Loret, S. Sakai, Y. Gallais, M. Cazayous, M.-A. Méasson, A. Forget, D. Colson, M. Civelli, A. Sacuto, Phys. Rev. Lett. 116, 197001 (2016). ARPES view of orbitally resolved quasiparticle lifetimes in iron pnictides, V. Brouet, D. LeBoeuf,P-H Lin, J. Mansart, A. Taleb-Ibrahimi, P. Le Fevre, F. Bertran, A. Forget, D. Colson, Phys. Rev. B 93, 085137 (2016). Collapse of the Pseudogap in Cuprate Superconductors at a Lifshitz Transition, S. Benhabib, A. Sacuto, M. Civelli, I. Paul, M. Cazayous, Y. Gallais, M.-A. Méasson, R. D. Zhong, J. Schneeloch, G. D. Gu, D. Colson and A.Forget, Phys. Rev. Lett. 114, 147001 (2015). Three energy scales in the superconducting state of hole-doped cuprates detected by electronic Raman scattering , S. Benhabib, Y. Gallais, M. Cazayous, M.-A. Measson, R. D. Zhonge, J. Schneelocheand, A. Forget, G. D. Gu, D. Colson, A. Sacuto, Phys. Rev. B 92, 134502 (2015). Anomalous phonon red shift in K-doped BaFe2As2 Iron-pnictides, B. Xu, Y. M. Dai, B. Shen, H. Xiao, Z. R. Ye, A. Forget, D. Colson,. Feng, H. H. Wen, C. C. Homes, X. G. Qiu, R. P. S. M. Lobo, Phys. Rev. B 91, 104510 (2015). NMR study of electronic correlations in Mn-doped Ba(Fe1-xCox)2As2 and BaFe2(As1-xPx)2,D. LeBoeuf, Y. Texier, M. Boselli, A. Forget, D. Colson, J. Bobroff, Phys. Rev. B (2013) condmat 1310.4969v2. New insights into the phase diagram of the copper oxide superconductors from electronic Raman scattering , Sacuto, A.; Gallais, Y.; Cazayous, M.; Méasson M.-A., Gu G. D., Colson D., Reports on Progress in Physics Vol. 76 (2), 022502 (2013). High Field Determination of Superconducting Fluctuations in High-T c cuprates, Rullier-Albenque, F.; Alloul, H.; Colson, D.; et al., Journal of Physics: Conference Series Vol. 449, 012010 (2013). Raman scattering as a probe of charge nematic fluctuations in iron based superconductors, X-Y. Yang, Y. Gallais, R.M. Fernandes, I. Paul, L. Chauvière, M.A. Méasson, M. Cazayous, A. Sacuto, D. Colson, A. Forget, Phys. Rev. Lett 111, 267001 (2013). Incommensurate Spin Density Wave versus local magnetic inhomogeneities in Ba(Fe1-xNix)2As2: a57Fe Mössbauer spectroscopy study, A. Olariu, P. Bonville, F. Rullier-Albenque, D.Colson, A. Forget, New J. Phys. 14, 053044 (2012). Nanoscale textured superconductivity in Ru-substituted BaFe2As2 : universality put into question, Y. Laplace, J. Bobroff, V. Brouet, G.Collin, F. Rullier-Albenque, D. Colson A. Forget, Phys.Rev.B 86, 020510 (2012). Opening of the superconducting gap in the hole pockets of Ba(Fe1-xCox)2As2 as seen via Angle-Resolved PhotoElectron Spectroscopy, B. Mansart, E. Papalazarou, M. Fuglsang Jensen, V. Brouet, L. Petaccia, L. de' Medici, G. Sangiovanni, F. Rullier-Albenque, A. Forget, D. Colson, M. Marsi, Phys. Rev. B 85, 144508 (2012). Vortex pinning: A probe for nanoscale disorder in iron-based superconductors, van der Beek, C. J.; Demirdis, S.; Konczykowski, M.; Fasano, Y.; Cejas Bolecek, N. R.; Pastoriza, H.; Colson, D.; Rullier-Albenque, F., Physica B 407, 1746 (2012). Impact of the two Fe unit cell on the electronic structure measured by ARPES in iron pnictides, Brouet, V.; Jensen, M. Fuglsang; Lin, Ping-Hui; Taleb-Ibrahimi, A.; Le Fevre, P.; Bertran, F.; Lin, Chia-Hui; Ku, Wei; Forget, A.; Colson, D., Phys. Rev B 86, 075123 (2012). Multiorbital effects on the transport and the superconducting fluctuations in LiFeAs, F. Rullier-Albenque, D. Colson, A. Forget, H. Alloul, Phys. Rev. Lett. 109, 187005 (2012). Direct evidence of interchange between hole doping and Curie paramagnetism in underdoped YBa2Cu3Ox, J. Biscaras, B. Leridon, D.Colson, A. Forget, P. Monod, Phys Rev B 85, 134517 (2012). Different effects of Ni and Co substitution on the transport properties of BaFe2As2, A. Olariu, F. Rullier-Albenque, D. Colson, A. Forget, Phys. Rev. B 83, 054518 (2011). Angle-resolved photoemission study of the role of nesting and orbital orderings in the antiferromagnetic phase of BaFe2As2, M. Fuglsang Jensen, V. Brouet, E. Papalazarou, A. Nicolaou, A. Taleb-Ibrahimi, P. Le F`evre, F. Bertran, A. Forget, D. Colson, Phys. Rev. B 84, 014509 (2011). Orbital nature of the hole-like Fermi surface in superconducting Ba(Fe1-xCox)2As2., Mansart, B.; Brouet, V.; Papalazarou, E.; Jensen, M. Fuglsang; Petaccia, L.; Gorovikov, S.; Grum-Grzhimailo, A. N.; Rullier-Albenque, F.; Forget, A.; Colson, D.; Marsi, M., Phys. Rev. B 83(6), 064516 (2011). Strong pinning and vortex energy distributions in single-crystalline Ba(Fe1−xCox)2As2, S. Demirdis¸ C. J. van der Beek, Y. Fasano, N. R. Cejas Bolecek, H. Pastoriza, D. Colson, F. Rullier-Albenque, Phys. Rev. B 84, 094517 (2011). Raman scattering study of spin-density-wave order and electron-phonon coupling in Ba(Fe1−xCox)2As2, L. Chauvière, Y. Gallais, M. Cazayous, M. A. Méasson, A. Sacuto, D. Colson, A. Forget, Phys. Rev. B 84, 104508 (2011). Electronic Raman scattering in copper oxide superconductors: Understanding the phase diagram, A. Sacuto, Y. Gallais, M. Cazayous, S. Blanc, M.-A. Measson, J. Wen, Z. Xu, G. Gu, D.Colson, CR Académie des Sciences Physique 12, 480-501 (2011). Hole and electron contributions to the transport properties of Ba(Fe1−xRux)2As2 single crystals, F. Rullier-Albenque, D. Colson, A. Forget, P. Thuéry, S. Poissonnet, Phys. Rev. B 81, 224503 (2010). Incommensurate spin density wave in Co-doped BaFe2As2, P. Bonville, F. Rullier-Albenque, D. Colson A. Forget, EPL 89, 67008 (2010). Absence of large nanoscale electronic inhomogeneities in the Ba(Fe1-xCox)2As2 pnictide. Laplace, Y.; Bobroff, J.; Rullier-Albenque, F.; Colson, D.; Forget, A, European Physical Journal B: Condensed Matter and Complex Systems 73(2), 161 (2010). Optical conductivity of sub-gap absorption in the superconducting state of 2 Ba(Fe,Co)2As2, R. P. S. M. Lobo, Y. Dai, U. Nagel, T. Room,J. P. Carbotte, T. Timusk, D. Colson, Phys. Rev. B 82, 100506 (2010). Ultrafast transient response and electron-phonon coupling in the iron-pnictide superconductor Ba(Fe1−xCox)2As2, B. Mansart, D. Boschetto, A. Savoia, F. Rullier-Albenque, F. Bouquet, E. Papalazarou, A. Forget, D. Colson, A. Rousse, M. Marsi, Phys. Rev. B 82, 024513 (2010). Significant Reduction of Electronic Correlations upon Isovalent Ru Substitution of BaFe2As2, V. Brouet, F. Rullier-Albenque, M. Marsi, B. Mansart, M. Aichhorn, S. Biermann, J. Faure, L. Perfetti, A. Taleb-Ibrahimi, P. Le Fèvre, F. Bertran, A. Forget, D. Colson, Phys. Rev. Lett. 105, 087001 (2010). Loss of antinodal coherence with a single d-wave superconducting gap leads to two energy scale for underdoped cuprate superconductors, S. Blanc, Y. Gallais, M. Cazayous, M.A. Méasson, A. Georges, J.S. Wen, Z.J. Xu, G.D. Gu, D. Colson, Phys. Rev. B 82, 144516 (2010). Superconducting fluctuations, pseudogap and phase diagram in cuprates, H. Alloul, F. Rullier-Albenque, B. Vignolle, D. Colson, A. Forget, EPL 91, 37005 (2010). Uniaxial and Hydrostatic Pressure Studies on Optimally Doped HgBa2CuO4+δ Single Crystals, F. Hardy, N. J. Hillier, C. Meingast, D. Colson, Y. Li, M. Greven, J. S. Schilling, Phys. Rev. Lett. 105, 167002 (2010). Nesting between hole and electron pockets in Ba(Fe1-xCox)2As2 (x=0.3) observed with angle resolved photoemission, V. Brouet, M. Marsi, B. Mansart, A. Nicolaou, A. Taleb-Abrahimi, P. Le Fèvre, F. Bertran, F. Rullier-Albenque, A. Forget,and D. Colson., Phys. Rev. B, 80, 165115, (2009). Atomic coexistence of superconductivity and incommensurate magnetic, order in the pnictide Ba(Fe18722;xCox)2As2, Y. Laplace, J. Bobroff, F. Rullier-Albenque, D. Colson, and A. Forget, Phys. Rev. B, 80, 140501(R) (2009). Doping dependence of the lattice dynamics in Ba(Fe18722;xCox)2As2 studied by Raman spectroscopy, L. Chauvière, Y. Gallais, M. Cazayous, A. Sacuto, M.A. Méasson, D. Colson, and A. Forget., Phys. Rev. B, 80, 094504, (2009). Dynamics Exchange Boson in Cuprates:Optical Conductivity of HgBa2CuO4+d., J. Yang, J. Hwang, E. Schachinger, J.P. Carbotte, R. Lobo, D. Colson,A. Forget, and T. Timusk. Phys. Rev. Lett., 102, 027003/1 (2009). Thermodynamic signature of a phase transition in the pseudogap phase of YBa2Cu3Ox high-TC superconductor, B Leridon, P. Monod, D. Colson, and A. Forget. Europhys. Lett., 87, 17011, (2009). Breakpoint in the evolution of the gap through the cuprate phase diagram, W. Guyard, M. Le Tacon, M. Cazayous, A. Sacuto, A. Georges, D. Colson, A. Forget., Phys. Rev. B 77, 024524 (2008). Temperature dependence of the gap size near the brillouin-zone nodes of HgBa2CuO4+delta superconductors, W. Guyard, A. Sacuto, M. Cazayous, Y. Gallais, M. Le Tacon, D. Colson, and A. Forget, Phys. Rev. B 101 097003 (2008).